Are you a fan of online games? If yes then you have come to right place. The main advantage on playing online games is that you can play with many users and play from any computers connected with internet. There are many popular online games available. 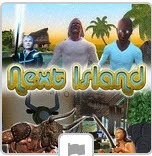 Today I’m going to tell about a brand new online game – Next Island. To play this game visit Next Island and create an account there. As it’s free game you don’t need to pay for this only an Entropia Universe account is needed. After creating the account download the client software which is required to play the game. This comes with really good graphics and sound effects. Game play and story line is engaging. I’m sure if you love to play online games then you will like to play this game.